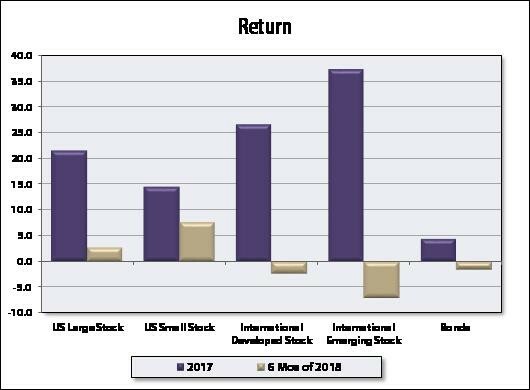 Attributing reasons for short term market performance after the fact is a favorite past time of financial media. We do not see a lot of value engaging in the exercise. Other than to sound smart, the purpose of the attribution seems to be to try and understand cause and effect in markets. For example, Trump says “x” means the market does “y” or job numbers are good/bad and the market will be good/bad. In theory once one knows the relationships, investing becomes about predicting the causes because one knows the effect. There are several problems with this logic. First, the reasons markets move up or down is much more complicated than a simple “x” causes “y”. Markets are subject to both positive and negative feedback loops. They overreact, under-react, and sometimes react opposite as expected. We, or any computer for that matter, cannot come close to understanding all the “causes” necessary to predict markets nor all the relationships. The second reason the logic fails, is it is just as impossible to predict what the cause is as it is the effect. How are we going to predict what Trump will tweet one morning if he does not even know himself? That was a low blow, but I think you get the point. Knowing what the latest GDP report or inflation number before the fact is nearly impossible. The third reason the logic fails is more nuanced, but important. You cannot profit from identifying a relationship if everyone else already knows the relationship. If everyone already knows, markets have already moved in anticipation and it is too late to profit from your knowledge. So not only do you need to identify relationships you need to be only one who does. This is very difficult. Anyway, the attribution will continue forever as investors try to look for some relationship that others don’t see (and it sells newspapers and brings in good ratings). Attribution is looking backward, we would rather look to the future. There is a reason your windshield is much larger than your rear view mirror. Although sometimes concerning, small moves in markets (say up to 10%) almost always leave us on the sidelines. We are at our core, value managers, meaning we are looking for investments to buy at below market value. Small moves just do not create enough opportunity. So far, this year and for the past several years, markets have not fallen enough to motivate us to purchase more stock. We continue to believe most stock markets, especially in the US, remain overvalued so we continue to overweight overseas stock markets. This was a big winner last year, but has hurt this year. As we have discussed in the past, we also closely watch markets for opportunities to reduce positions if we judge a significant downtrend is occurring. Once again this is typically not going to be a 5% or 10% move like we have seen recently. On the fixed income or bond side of the portfolio, we have protected principal reasonably well with a shorter maturity bonds versus our benchmark as interest rates have risen. Keep in mind, although interest rate increases in the short term are painful, they ultimately are beneficial as future bond returns rise. Regardless of the recent increase in yields they are still at historically low levels meaning expected returns on bonds remain depressed. Last December you may recall we added the Stone Ridge Reinsurance fund to portfolios. Since its addition it us up around 1.0% exceeding its benchmark. In addition, most gains come in the second half of the year as perils are avoided. We continue to look for investments that do not move with stocks and bonds. Investments like reinsurance that are dependent upon other factors than the economy to drive returns. Because of the recent volatility, markets have presented an opportunity to harvest some losses for tax purposes. You will likely see trades over the next quarter for this purpose, especially if the market does not rebound. If you would like to discuss your portfolio in more detail, please let us know. We appreciate the trust you have placed in us.